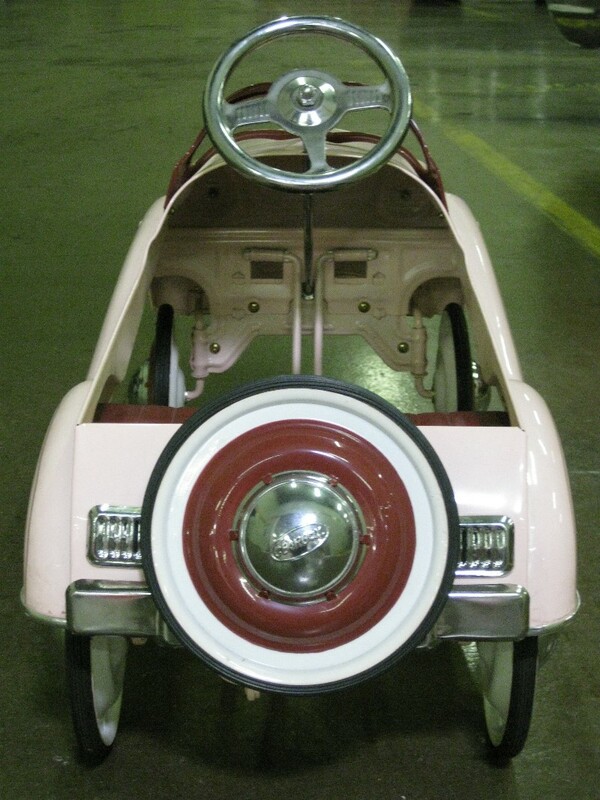 One of the most popular pedal car types is the Murray. Murray Manufacturing was founded in the early 1900's, with a factory in Ohio to produce pedal cars, bicycles, toys, and automobile parts. In the years prior to World War II, they produced many Steelcraft toys, including smaller metal toys and pull toys. They also produced a few cars under the Steelcraft name during the 1920's and 1930's. What they are really known for, however, is the production of ride in cars and bicycles in the 1940's and 1950's, during the height of pedal toy popularity. The 'Murray' name was not actually used on their products until 1940; today, it is nearly synonymous with the classic pedal toy. Although pedal cars date to around the time the Murray company was founded, they are not known to have offered a range of pedal toys until 1940. In 1940 and 1941, they produced many different Murray/Steelcraft toys, mainly modeled after Chrysler, Pontiac, and several other actual car makes rather than new designs specifically meant for pedal cars. 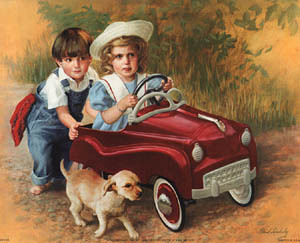 Because of World War II, the factory was unable to make children's toys during the mid-1940's, though production picked up again in 1947 at a rate much higher than before. During the height of the pedal car craze in the 1950's and 1960's, Murray was one of the most well-known manufacturers of these toys. Their famous ride on toys were marked 'Murray' or 'Murray Ohio' to distinguish these high-quality steel pedal toys from other companies'. 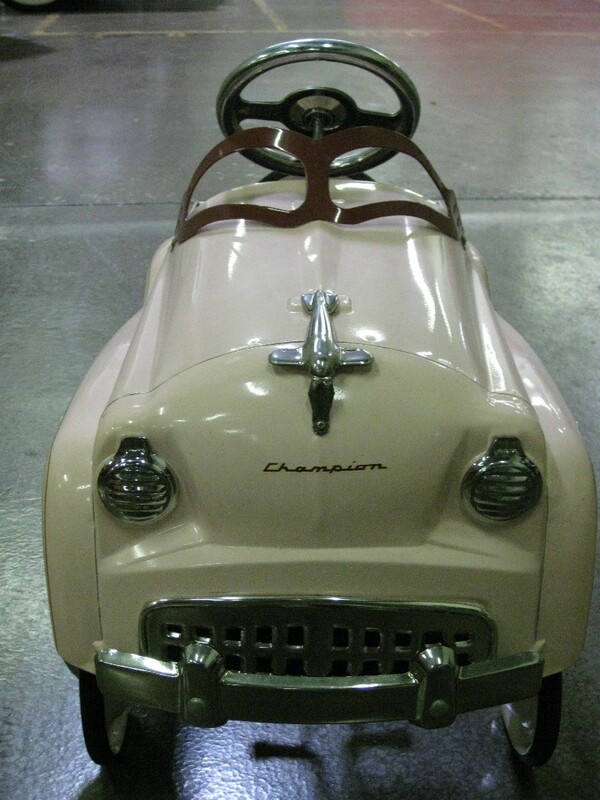 Murray cars are most often the type of car that people think of when they think of a classic steel kids car, with the classic styling of an actual full-sized car model. They produced many different versions, including hot rods, fire trucks, dump trucks, and station wagons. Each of the dozens of different models is known for the Murray trademark detailing, including shiny chrome trim, windshields, working lights, and other features. By the early 1970s, a declining birth rate and the advent of plastic ride-on toys brought an end to this craze. 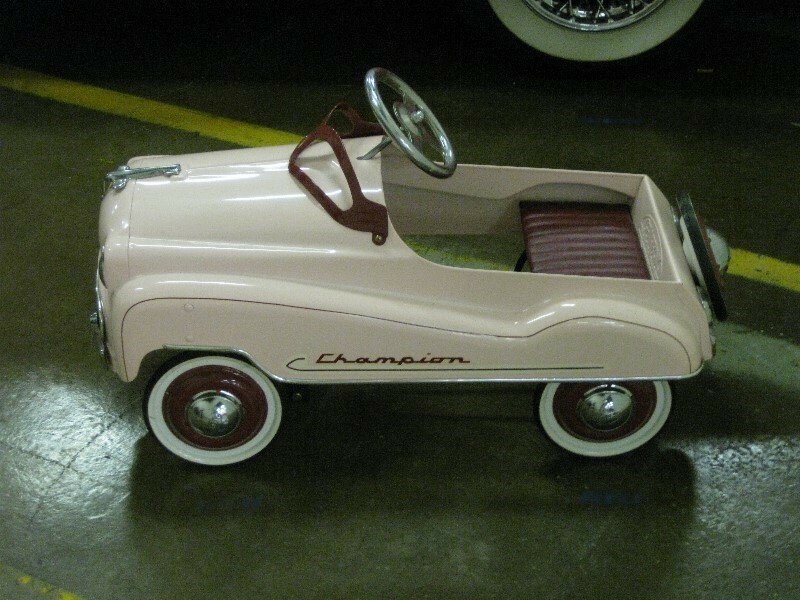 This sales decline was enough to take out even the biggest pedal car manufacturers. Murray stopped making these treasured toys altogether, and began manufacturing newly popular power lawn mowers instead. Today, the same Murray company is known for go karts, lawnmowers, and other equipment; currently, no toys such as pedal cars or bicycles are produced by Murray. Today, these classic Murray cars are prized by collectors, who even snap up reproductions of the original Murray models, some of which the Murray company stopped producing over fifty years ago. Hobbyists are even reproducing parts of these original Murray cars in the hopes of restoring cherished toys of the 1950's and 1960's. They are even memorialized in a series of Hallmark ornaments. Restored versions can cost thousands of dollars, depending on rarity. A powder blue Champion sports car built by Murray sold at auction for over seventy thousand dollars, enough to purchase a brand new full-size car. WASHINGTON, D.C. - In cooperation with the U.S. Consumer Product Safety Commission, (CPSC), Alpha International Inc., also known as Gearbox Pedal Car Company, of Cedar Rapids, Iowa, is voluntarily recalling about 75,000 pedal cars. The paint coating on some of these pedal cars contains high lead levels. CPSC standards ban toys and other children's products containing high levels of lead. Young children could ingest the lead from the car's paint coating, presenting a lead poisoning hazard. Alpha International has not received any reports of injuries involving these pedal cars. This recall is being conducted to prevent the possibility of injury. Fire Trucks: "Fire Truck," "John Deere" and "Texaco." Police Cars: "NYPD," "Chicago Police," "Highway Patrol" and "EMERGENCY 911." Sedans: pink "Champion," blue "Champion," "Texaco," "John Deere," "Citgo," "Raley's Coca-Cola," "Raley's Keebler," and "Red Lion." 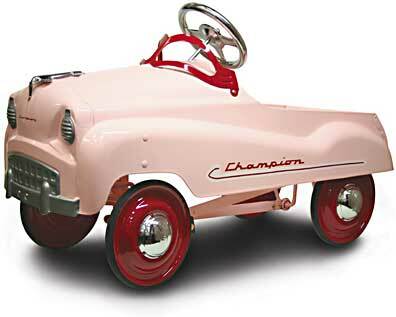 All of the pedal cars are made of metal and come in a variety of colors. Most of the cars have a "Gearbox" logo on the seat back, the hubcaps, and/or the pedals. The pedal cars were manufactured in Korea. The two "Raley's" cars were sold exclusively at Raley's supermarkets from July 2000 through December 2000. Department, toy, and specialty/collectible stores sold all of the other pedal cars from November 1999 through January 2002 for between $100 and $500. Consumers should take these pedal cars away from young children immediately. Consumers can contact Alpha International at (800) 368-6367 between 9 a.m. and 5 p.m. CT Monday through Friday to receive a replacement car or return the products to the place where purchased to receive a full refund.